Irish playwright, born in Dublin on July 26, 1856 and died on 2 November 1950 in the English County of Hertfordshire. It is one of the great figures of the universal theatre, so it was awarded the Nobel Prize in literature in 1925. His father was a Protestant Irish class media which, because of their addiction to alcohol, was left without a job, so the future author childhood was spent in the midst of poverty. It went through several public schools, some Catholic and other Protestant, but the poor economic situation of his family forced him to drop out of school to start working at an early age. His enormous interest in arts and letters pushed to expand their knowledge on their own, reading non-stop all that fell into their hands. It thus became a self-taught writer model. Her mother finally abandoned her alcoholic husband and went to London accompanied by her daughters. Bernard Shaw joined his mother and her sisters in 1876, with the intention to be known as a writer in the literary environment of the capital. It took much to move forward, always threatened by poverty. He/She worked in one of the first British telephone companies and managed to publish several articles of criticism musical (knew the secrets of this art, because his mother was a teacher of singing); but barely managed to get ahead. He published some novels that did not succeed, so their economic problems increased. However, he/she managed his opinions as a critic began to be taken into account, which allowed him to write journalistic articles on many topics. Meanwhile, he/she had come into contact with the main ideological currents that flourished in the late nineteenth century London. Read with attention the works of Marx and became a Socialist. It was one of the most prominent figures of the Fabian Society, a political and cultural grouping of great success among English intellectuals, who defended a socialism moderate, implemented little by little, without ever reaching the revolution. His music criticism articles (in which Brahms attacked and was defending Wagner) and theatrical (in which showed his enthusiasm for the works of the Norwegian Ibsen) gave him great prestige as wise and intellectual. Soon he/she became famous also for his plays, in which showed wit, humor and, above all, a huge master to analyze the English society of his time, showing its biggest flaws and defects. During the first quarter of the 20th century (1901-1925), his plays achieved a huge success, both in Britain and abroad. He/She came to be considered the best playwright in the English language, after Shakespeare; and he/she received the Nobel Prize in literature in 1925. Married to the Irish rich Charlotte Payne-Townshend (who had known the forty years of age), Bernard Shaw continued to write until you have reached a very advanced age. His wife died in 1943, when he/she was already eighty-seven years. 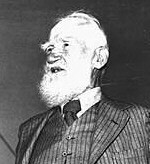 In 1950, Bernard Shaw suffered a fall while trying to prune a tree in his country house in Ayot St. Lawrence (in Hertfordshire, near London). To the amazement of everyone, its perfectly recovered from fractures that the blow had caused him; but the accident caused the reappearance of an old ailment which had suffered in the kidneys, and ended with his life at the age of ninety-four. Shaw is an awesome extension, as befits an author who lived ninety-four years, who dedicated near sixty at his trade of playwright. He/She was an undisputed master of dramatic literature. Few authors have mastered some basic techniques when writing plays, such as the construction of characters with as much perfection. In addition, the work of Shaw shows an effort to point out the errors and evils of society, while maintaining his desire to regenerate it and improve it. He conceived the theatre as an instrument capable of correcting the worst vices and defects of society. But his works do not denounce crudely these negative aspects; on the contrary, use wit and humor to present on the scene that critical vision of the author. It also highlighted its criticism of art (music, theatre, literature in general) and for his views on the political and social life. Shaw renewed Theatre (and, in general, the literature) of his time. Universal master of dramatic art, built characters of astonishing realism, which, on the scene, speak and behave like beings of flesh and bone. The first works that premiered were the houses of the widower (1892) and the pisaverde (1893). But started to become really famous as a playwright with the profession of the Mrs. Warren (1894), which addressed one of the harder to the hypocritical society of his time: prostitution. Already with a reputation for brilliant and critical writer, Shaw premiered many parts in which continued denouncing the miseries of English, always with wit and humor society, as for example the arms and the man, Candida and you never know. From his marriage with Charlotte Payne-Townshend, Bernard Shaw had secured its economic situation and he/she could devote himself entirely to theatrical writing. Premiered, as well, some famous pieces such as: César and Cleopatra, man and Superman, major Barbara, the doctor's dilemma, reaching marriage, unequal marriage, the first work of Fanny, Androcles and the lion, House of pain, back to Methuselah and Santa Juana, the latter about the treatment of current men give to other exceptional beings. But his masterpiece is Pygmalion, dealing with love, education and the exploitation of one human being by another human being. Bernard Shaw has gone to the history of world literature through his plays. But was also the author of several notable novels, as for example, the profession of Cashel Byron, which is ahead of 20th-century literature to analyze an issue of great social interest: the world of prostitution; and an unsocial Socialist, work which shows his interest in the ideas of Marx. Was also the author of interesting studies and essays, including his essays Fabian, on his Socialist ideas and belonging to the Fabian Society; The quintessence of the ibsenismo, on the theater of the Norwegian Ibsen, whom Shaw admired; The perfect Wagnerian, which shows their great musical knowledge and his enthusiasm for the German Wagner compositions, and, finally, guide of the socialism for a smart woman.